In my bin of handwoven fabric, most of the pieces are leftovers, like a short section from the end of a towel warp, or a colorful sampling of weft from the beginning of a warp. But a few of these woven treasures are good-sized pieces that can be used to make something. 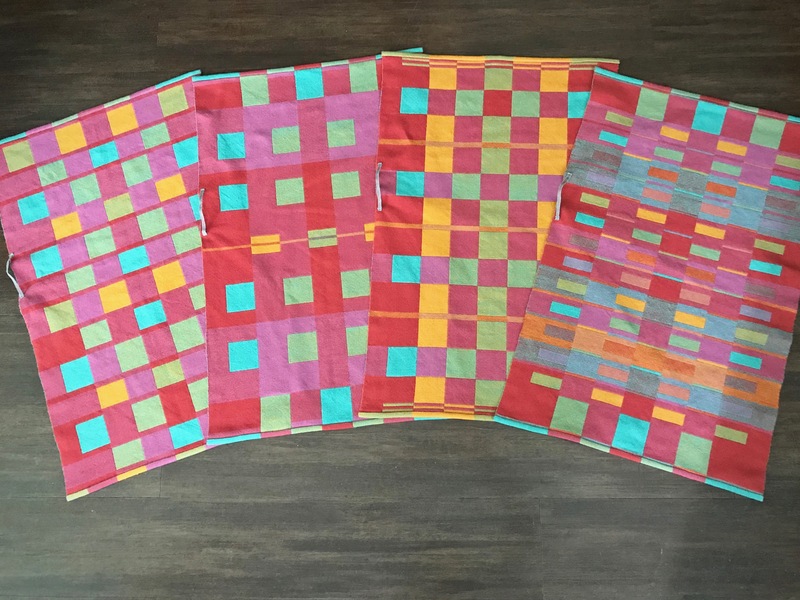 So, since I want to make a bag for my large Freja tapestry frame, I look through my selection of handwoven fabric pieces. 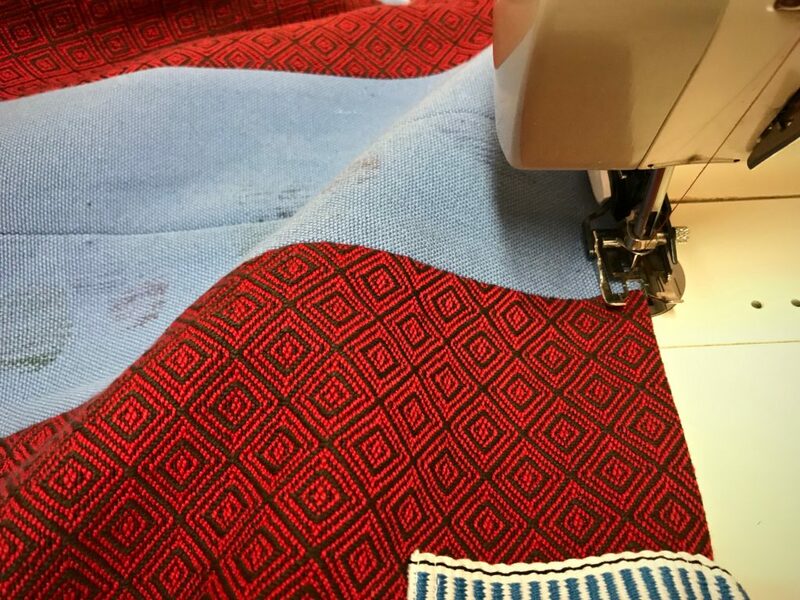 Piecing handwoven fabric to get the large side panels needed for the bag. 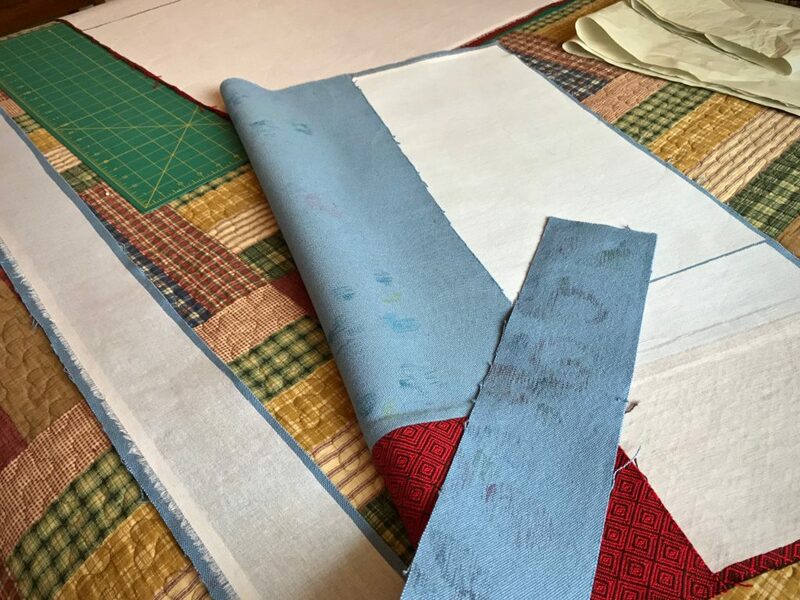 Lightweight fusible interfacing is applied to the back of the fabric. 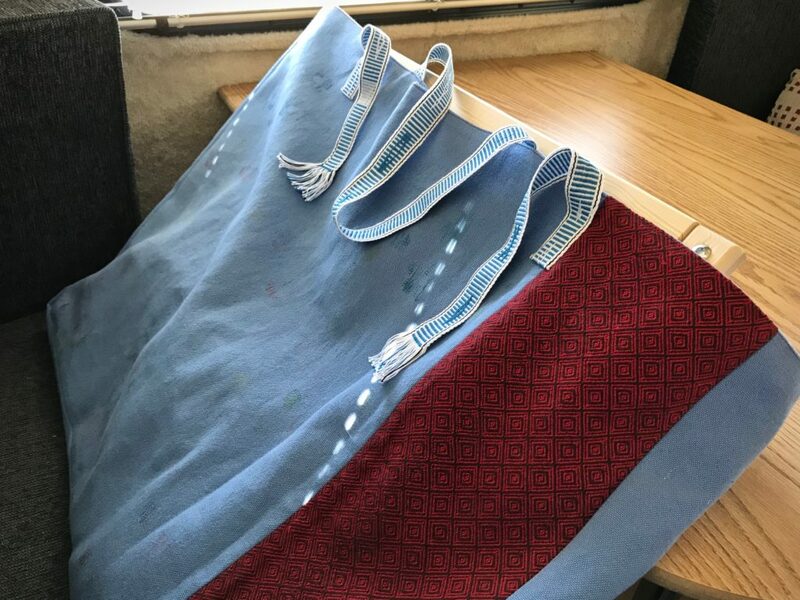 I adapted and enlarged McCall’s pattern 3894, and used the pattern instructions for the sequence of steps to make the bag. 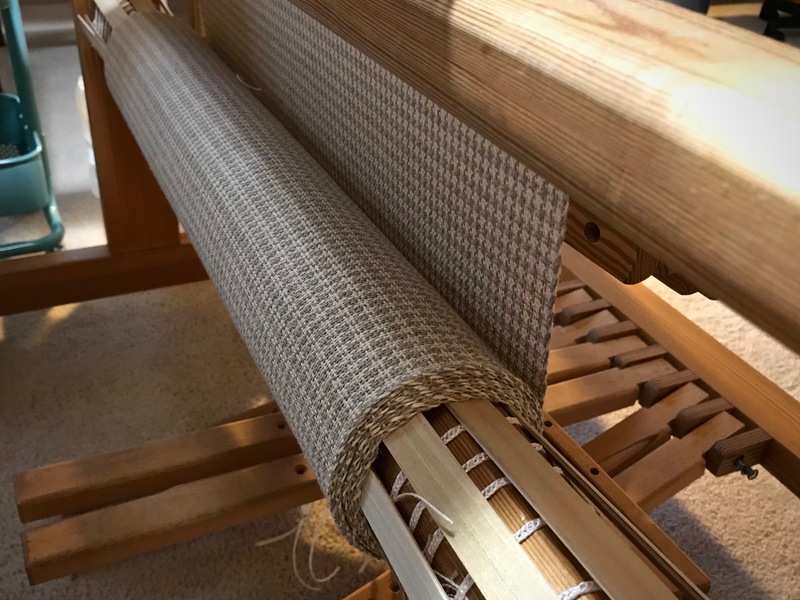 Patterned band woven on the band loom, used for straps on the bag. Bag with Freja loom is ready for a travel excursion in the Casita. Casita tapestry for quiet evenings in Big Bend state park in Texas. I may be able to finish it on this trip. 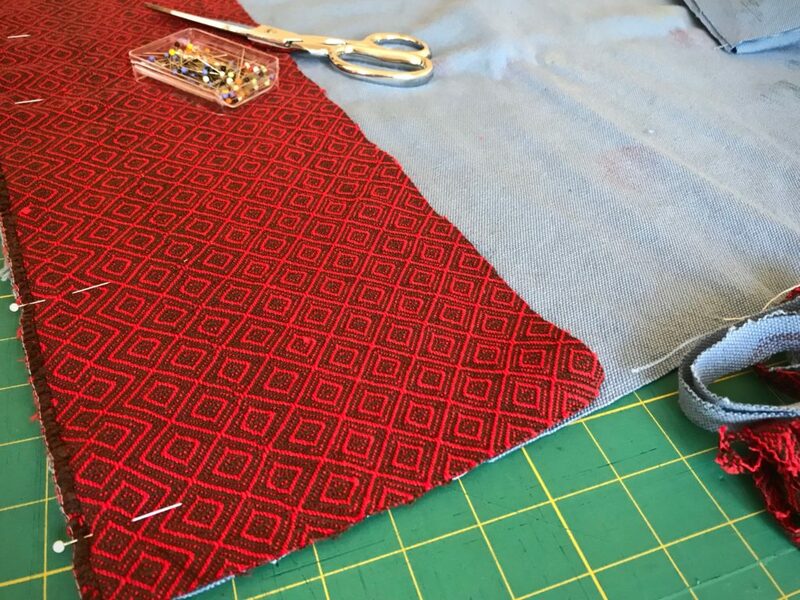 Blue cotton warp-printed fabric, red eight-shaft twill, and patterned band from the band loom. Treasures from the past, assembled together for a joyful today. Treasures from the past come into today to bring value and meaning. Put treasures in your today that will add value to tomorrow. Everything can change in a day, so we can’t put our confidence in tomorrow. But every new day is from the Lord, who holds the future in his hands. Today is a gift. Live it fully. Who knows? Your joy today may be tomorrow’s treasure. May you find treasures from the past. Great idea! Have a wonderful time! Hi Beth, We are having a great time in the mountains and desert this week at the state park. No moss is growing under your feet. Enjoy the moment. Enjoy the memories. All are a gift from God. PS.. The snow is leaving us and the leaves of the spring flowers are pushing through, and the squirrels ate the kale seeds I planted. Hi Nannette, It is always interesting to observe the changing of seasons. Here, where we are this week, we see cactus in bloom, desert bluebonnets (they will die off as soon as the temps reach 95 degrees), and red-tipped ocotillo everywhere. Dots of brilliant color on a backdrop of desert brown. The rugged and massive mountains declare the glory of God! I have so many scraps of my handwoven fabrics that I try to find uses for. In the process of moving now, I find there are far too many and I’ve bagged many to throw away. Sad! Enjoy Big Bend. It’s one of my favorite places. 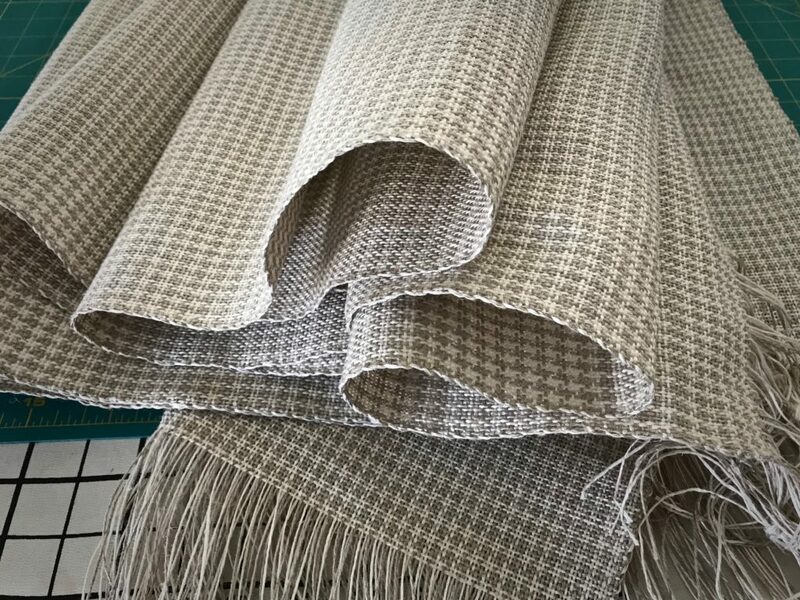 Hi Linda, It is sad to say goodbye to scraps of handwoven fabric. But the good thing is, you still get to enjoy the memories of all that time at the loom. Big Bend is such a unique and remote place. At times, the terrain is such that it seems like it could be another planet. There is beauty all around, but it’s different. I’m glad to know you enjoy this place, too. Talk about thick and thirsty towels! Double weave makes these hand towels thick. And the linen in the cottolin threads makes them highly absorbent. The colors are fantastic together. 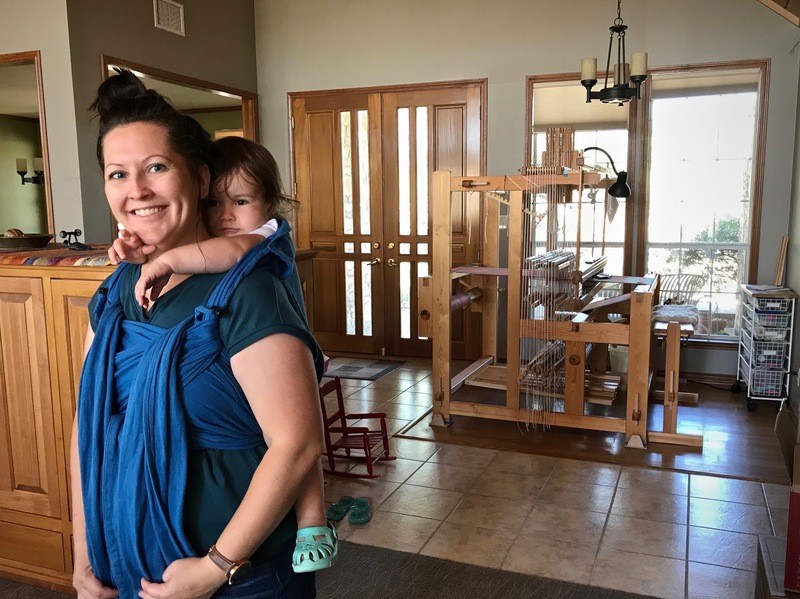 When our daughter Melody moves with her little family to Chile, she can set up her new home with these made-for-her towels. My love is woven into every single pick. I have included two short little videos just for the fun of it. Enjoy! 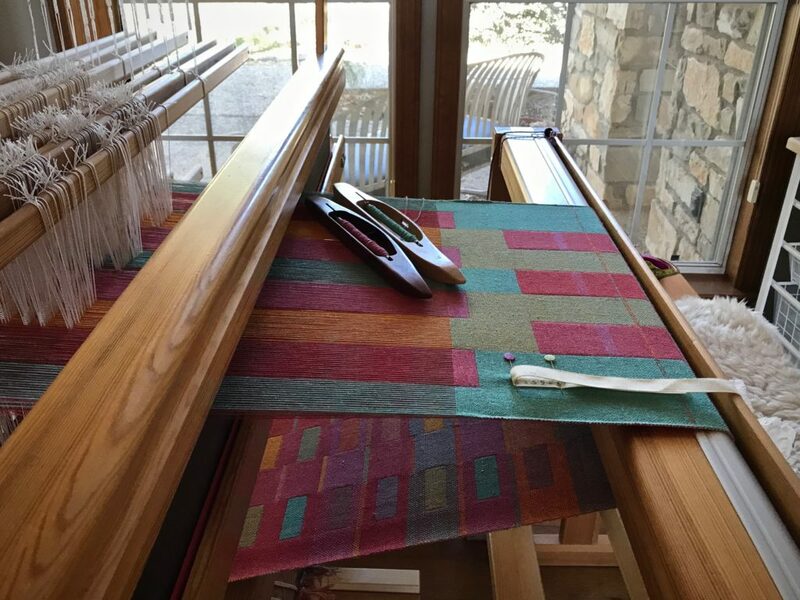 This project started in my weaving studio in our Houston home, where I beamed the warp. 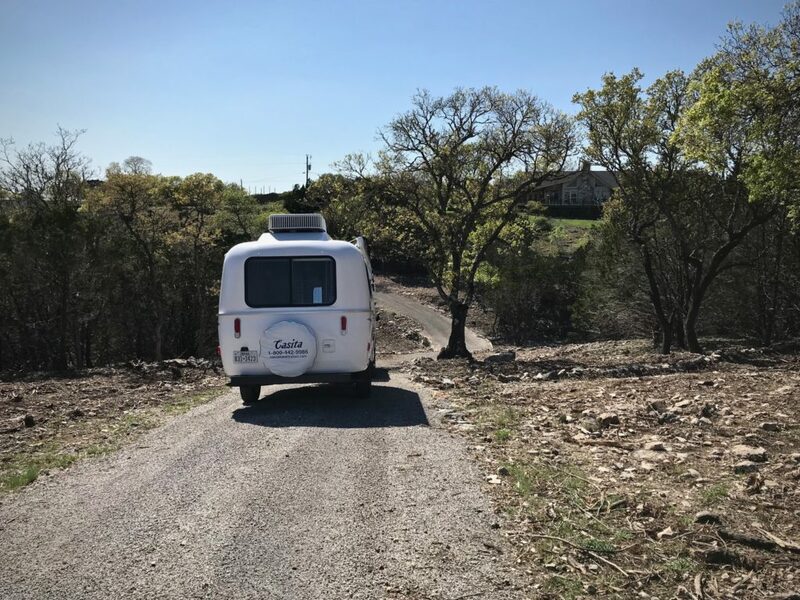 And then we decided to move! We sold the house and moved into an apartment. 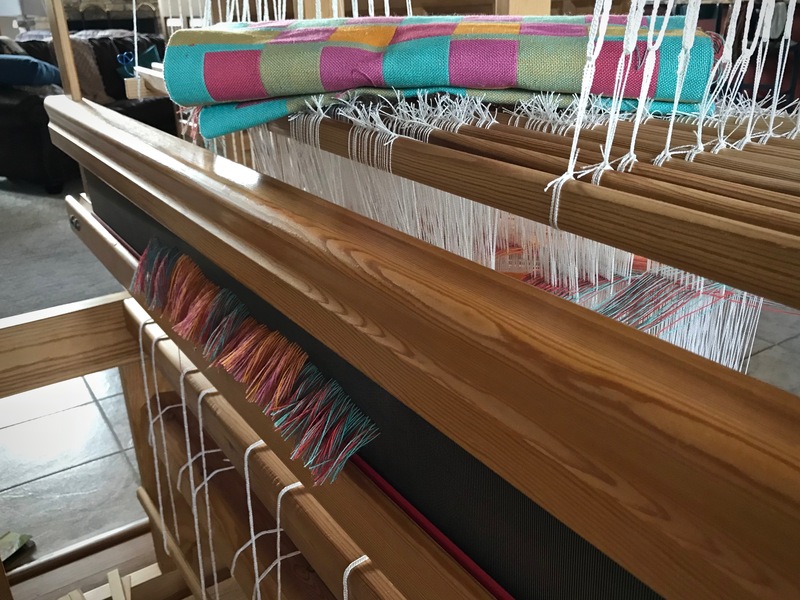 The big loom was dismantled, with the towel warp on the back beam. 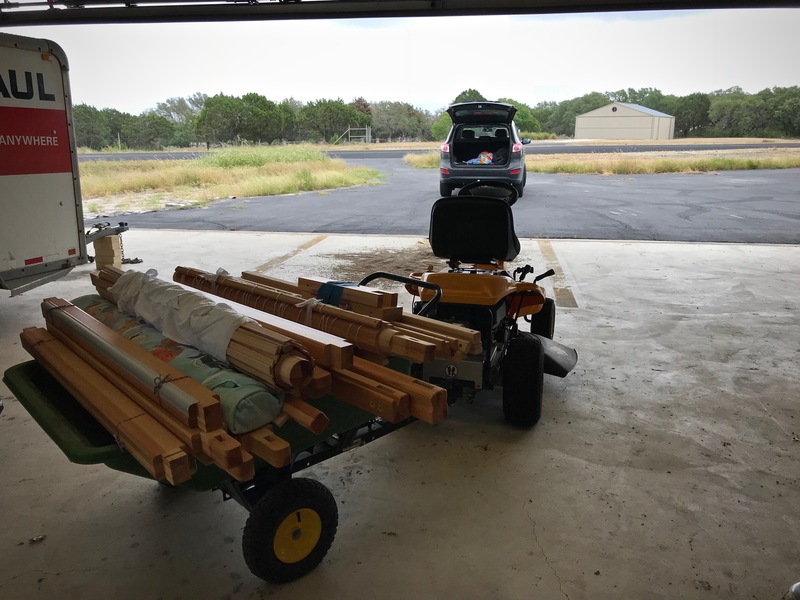 Then, we moved all the pieces to our Texas hill country home. 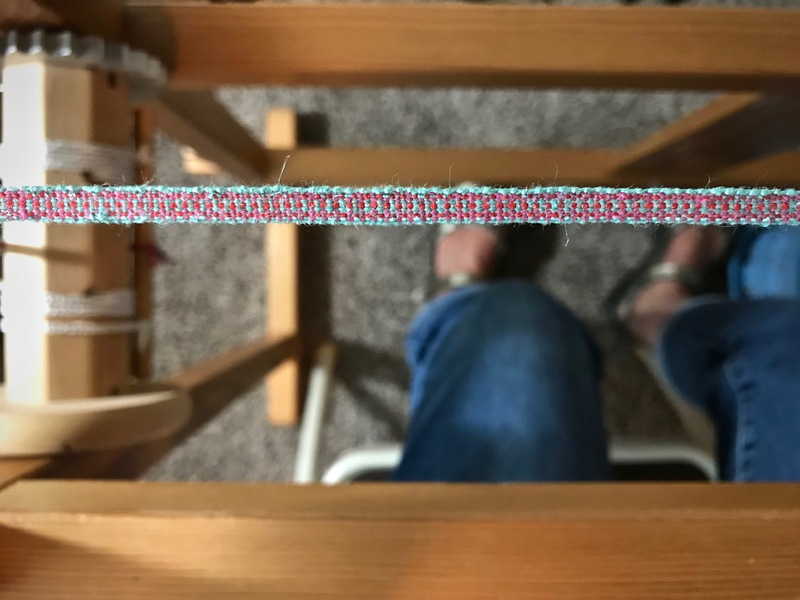 I wove hanging tabs on my band loom. 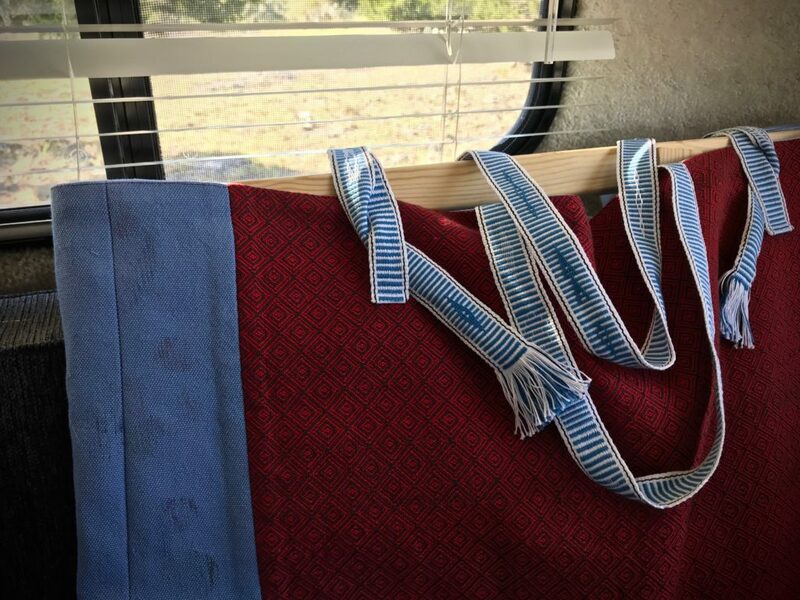 And I discovered that I could showcase both sides of the colorful towel if I stitch the hanging tab on the side of the towel, off center. The towels are hemmed and pressed, ready to brighten the day! May you put threads of love into everything you do. Thanks, Beth! I’m happy with how they turned out. Hi Pam, Thanks so much! I’m glad you like them. Beautiful towels and such love went into them. I know your daughter is going to love them as much as she loves you. .Entirely different results. All beautiful. Thank you for sharing the progression. 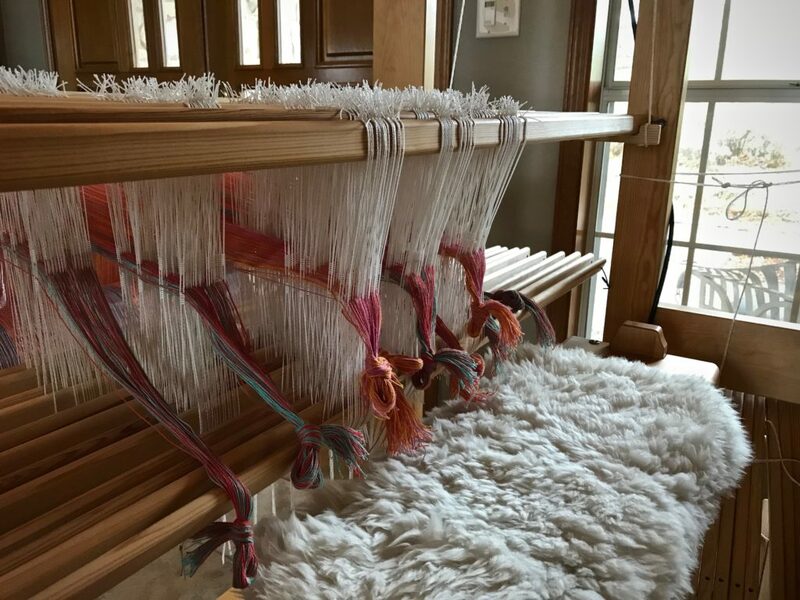 Hi Nannette, You’ve touched on one of my favorite aspects of weaving. Exploration! 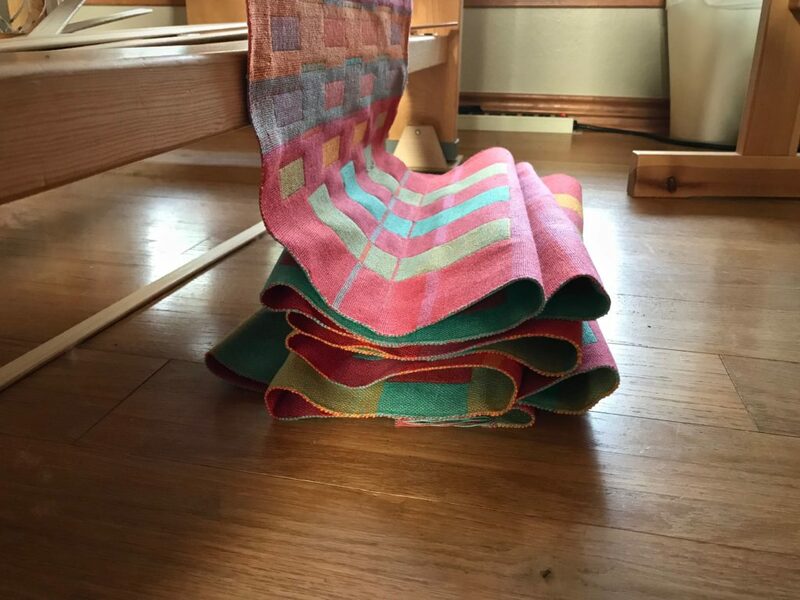 Every new towel is a chance to explore another design. It’s awfully hard for me to weave any two or more things exactly alike. Beautiful! 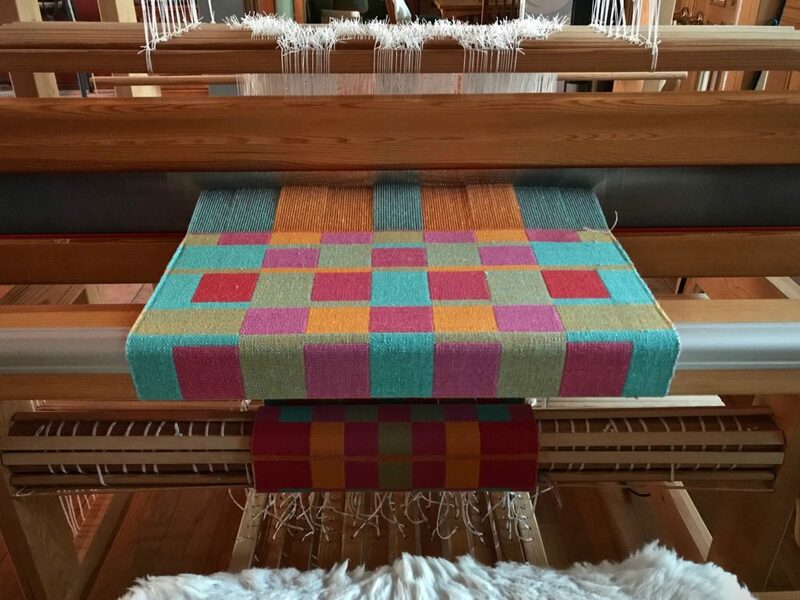 I’m always in awe of your weaving. Hi Sumac, You are so kind! 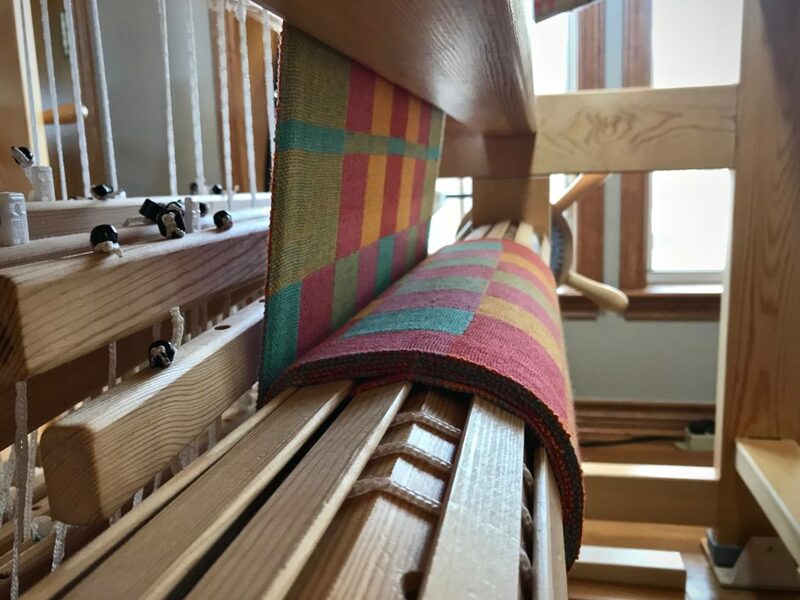 I feel very fortunate to get to play with threads on a loom. 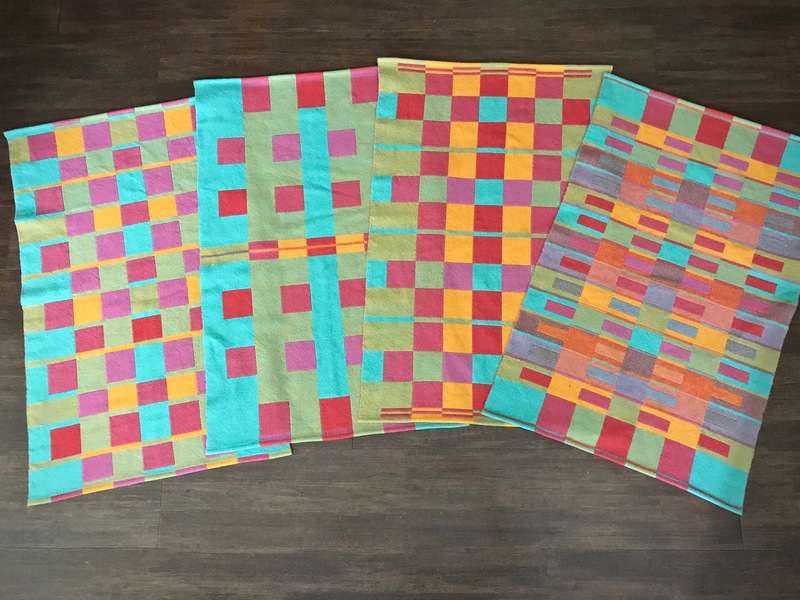 Goodness, those are beautiful towels that exude your love in a very joyful way. 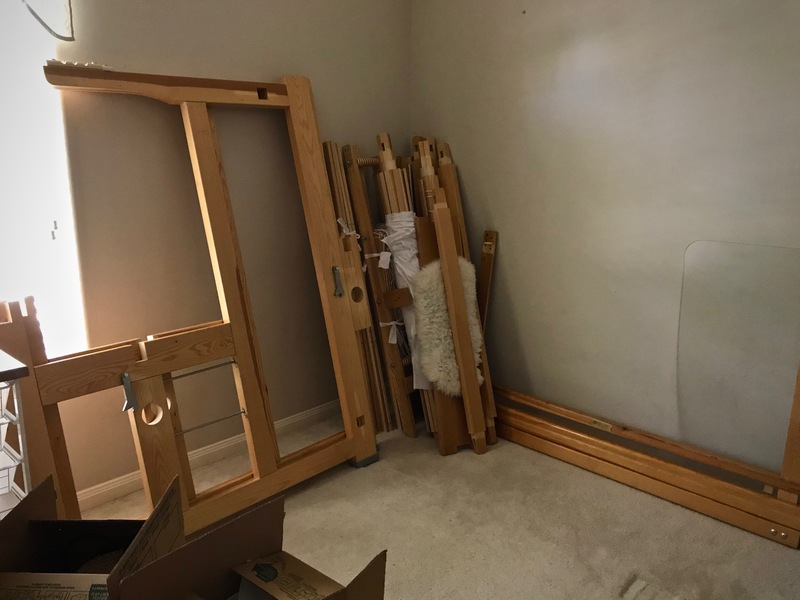 Thanks for documenting your process so well and sharing your inspire pictures. 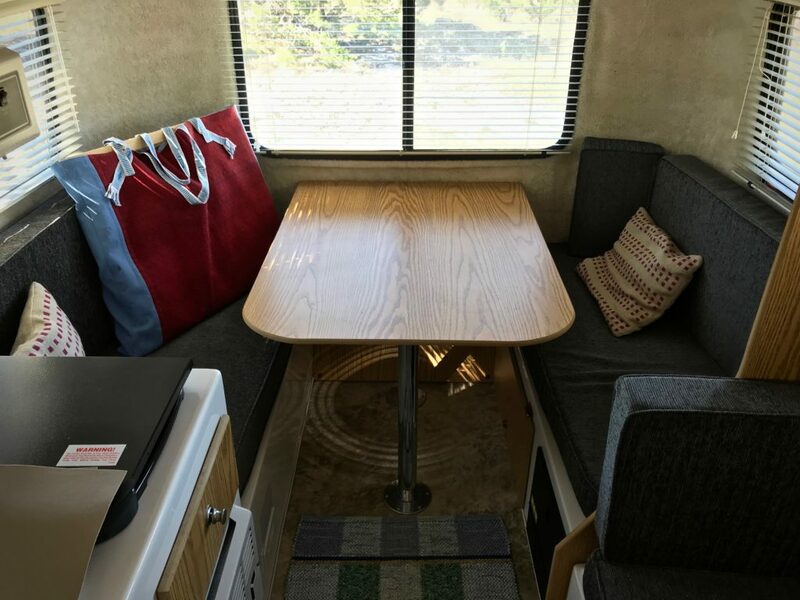 The placement of the hanging loops does the trick of showing both sides off it a very neat way. So very wonderful. Hi Jen, Your thoughtful comments make my day! I’m glad you enjoyed the pictures. This is the first time I’ve tried putting the hanging loops off-center on the side, but it really worked for this. Just beautiful! 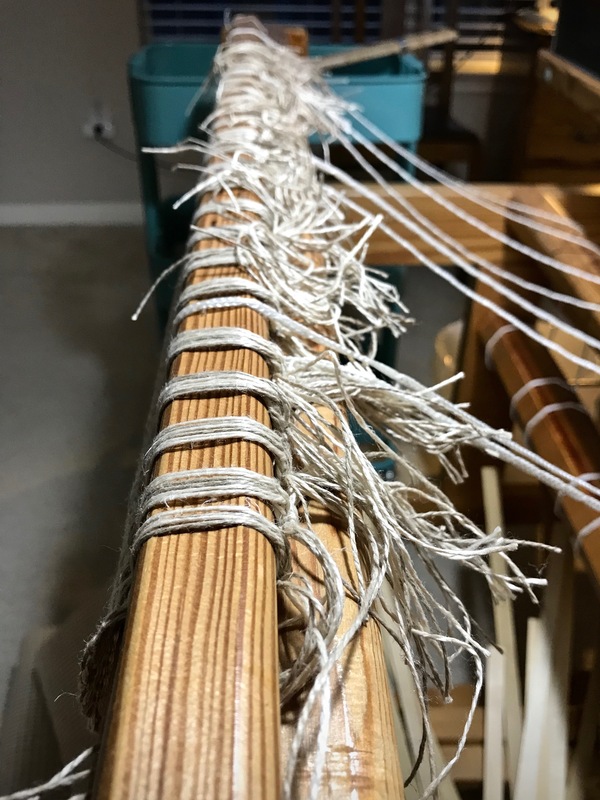 When you pin your twill tape marker to the woven piece on the loom, do you unpin the beginning section of tape before it goes rolls around the beam? I do not want the pins to go around the beam. I use just two pins, and “leapfrog” them as I advance the warp. 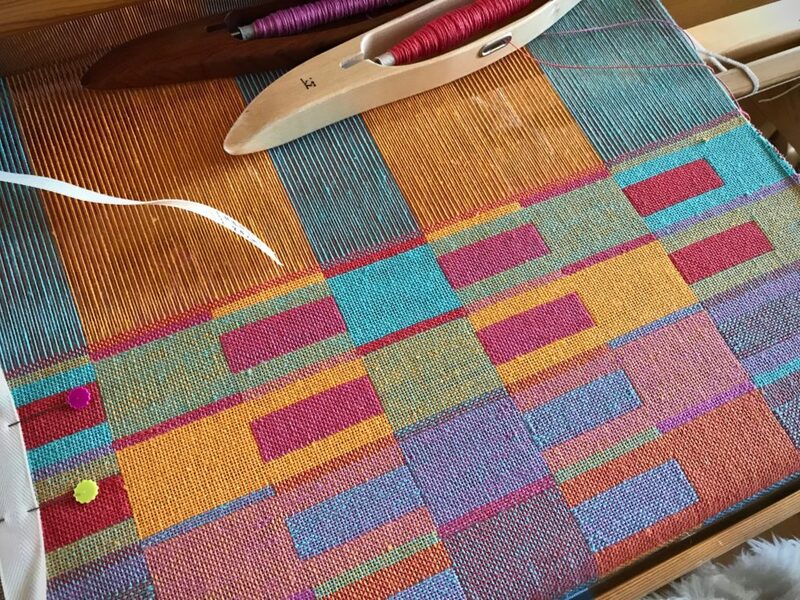 Here’s the link to a post I wrote about it: Tools Day: Measured Weaving. Those are absolutely beautiful. You can’t help but smile when you look at them. 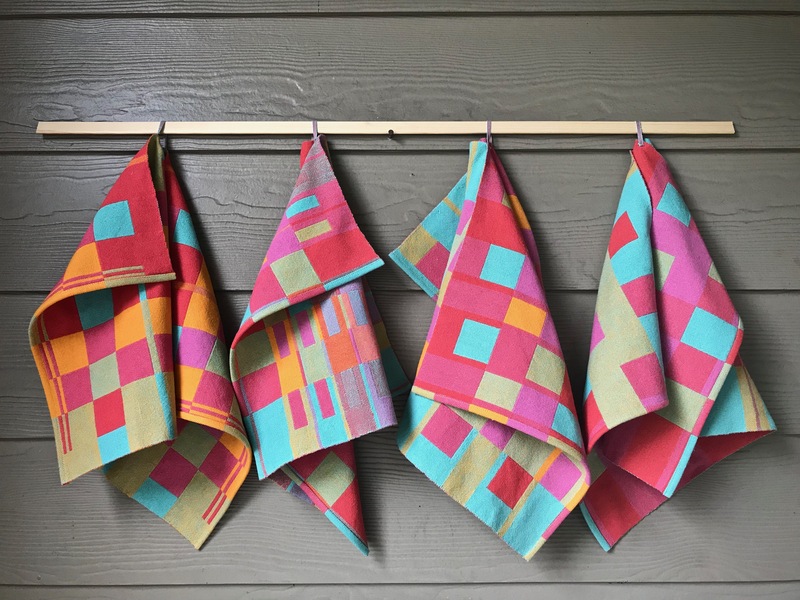 Can I find directions to this pattern somewhere? Hi Robin, Thank you! I’m glad you like it. 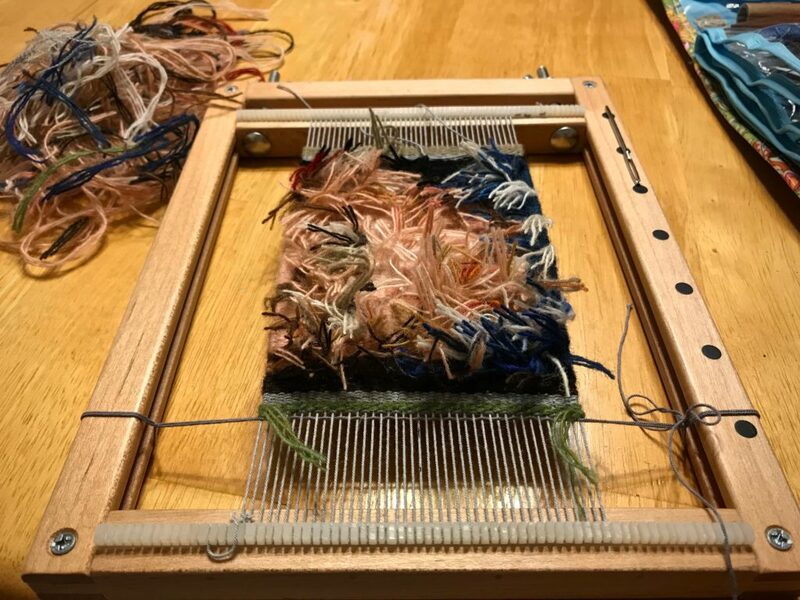 I modified a draft that is in “The Big Book of Weaving,” by Laila Lundell. If you send me an email through my “Get in Touch” page I will be happy to give you more information. Before I can hem these new towels, I need to make some hanging tabs. Band loom time! Making a warp for the band loom is one way to use up some of the weft on quills that didn’t quite get emptied when weaving the towels. 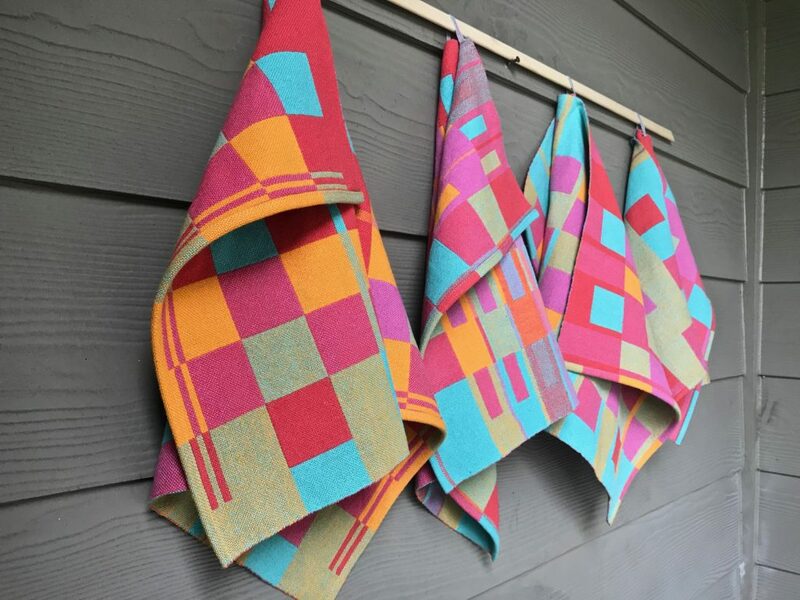 Of the four colors in the towels, I am using aqua, poppy, and orchid for the hanging tabs. The bright marigold, my favorite of the four colors, may bring too much attention to itself, so I’m leaving it out. 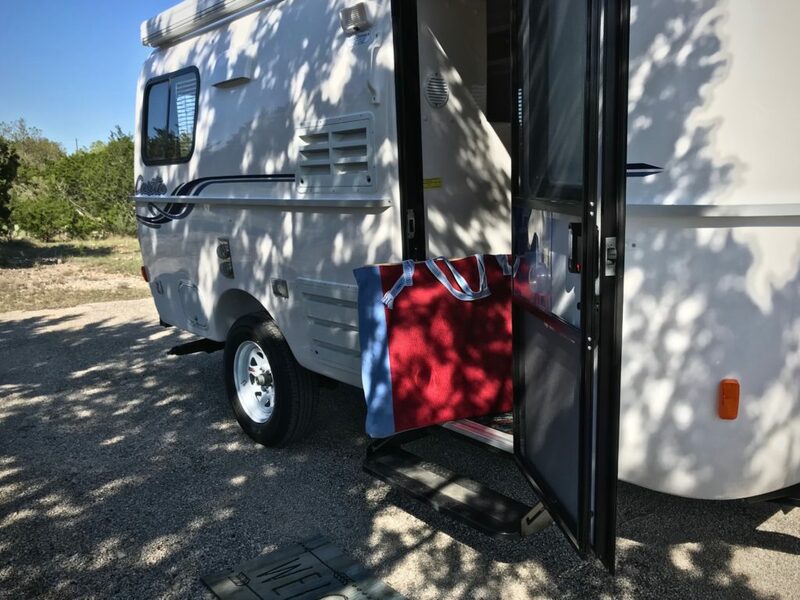 A hanging tab must be a stable and firm loop that becomes a pleasing part of the towel. 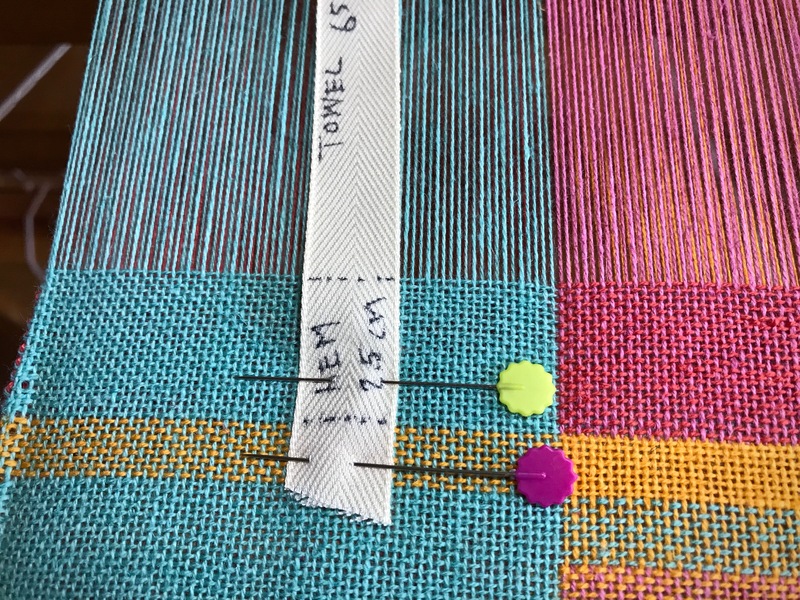 Towels, before wet finishing, are spread out with the thread colors on top. I am trying to determine which colors will work together in woven hanging tabs for all four towels. Simple symmetrical design with aqua, poppy, and orchid colors. 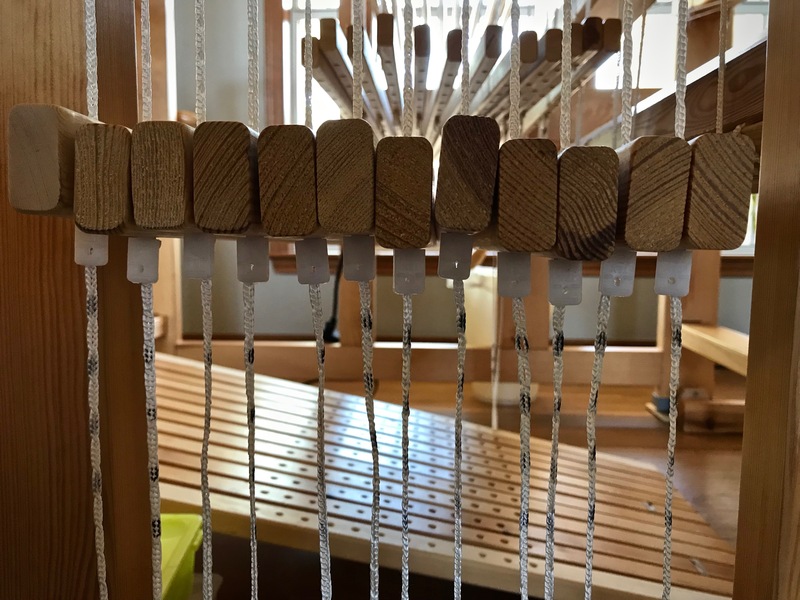 To use as hanging tabs for towels, the band is cut into short pieces, about ten centimeters (four inches) each. 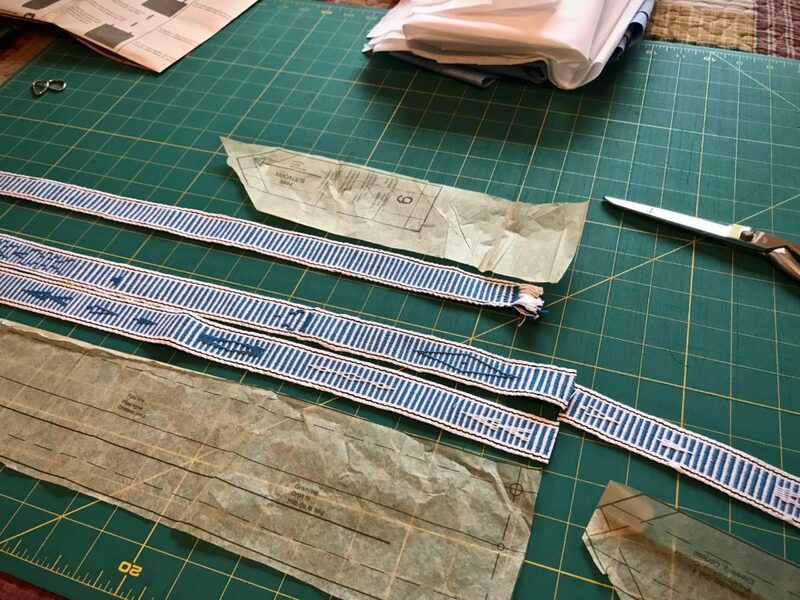 Each cut tab is then sewn into the hem of a towel. Established. Stable (root word of e-stabl-ish) and firm. That’s how important our faith is as we walk through life. Everything hangs from it. So it must be woven carefully and stitched in securely, a pleasing part of who we are. Stable and firm in faith as we live for the Lord—that’s a beautiful way to live. May your finishing details be pleasing. Your towels are beautiful. Love the little bobbin you are using. Do you mind telling me where you got that from? Love all your posts. Hi Laura, Thank you! My husband carved the little band loom shuttle for me. You probably know that you can use a short cardboard quill for band weaving, but I will email the specs of the little shuttle to you in case you or someone you know wants to carve one. Hi Nannette, All we humans tend to wander off course if we don’t have a firm foundation in life. 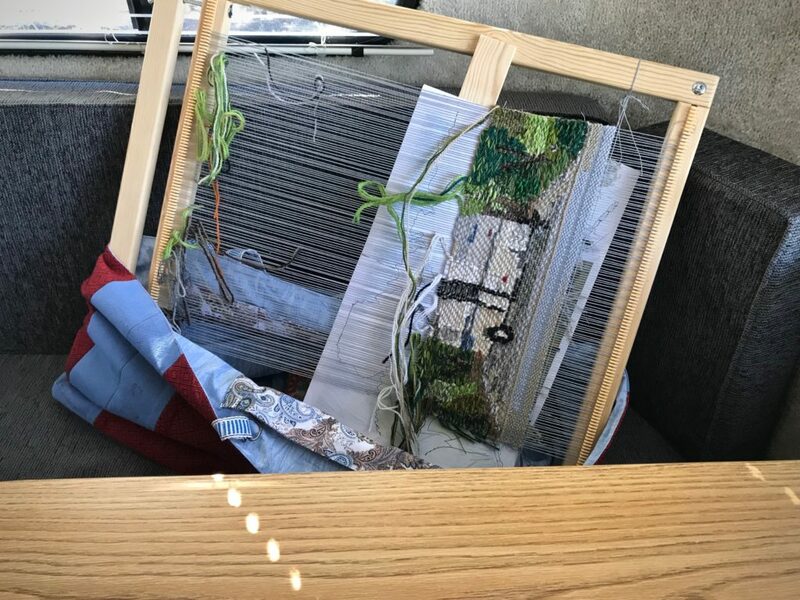 A little here, a little there, and eventually I finish another small tapestry. This little woven portrait of my granddaughter Lucia was a huge challenge. I knew that from the beginning. In fact, I had about three beginnings with this intimidating project. My aim is not to make a masterpiece, but to keep making. And making, and making. Every time I go beyond what I think I can do, I learn more. This Lucia Portrait Tapestry is best viewed from a distance. Up close, the details seem abrupt and harsh. 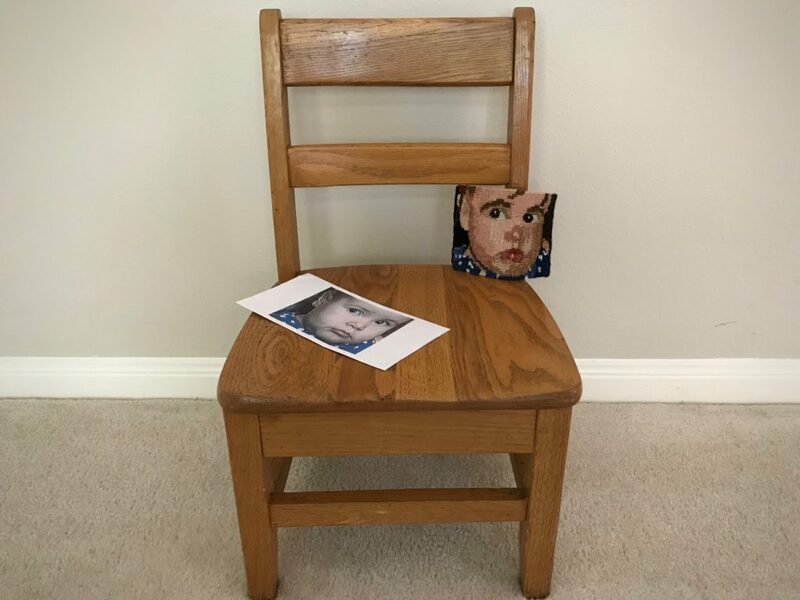 But when I look at her from across the room, I see the picture of a child’s face. I trimmed the weft tails on the back, steamed the piece, and made a half Damascus edging. The edging and the weft tails near the sides are stitched down. The hems are turned under and stitched. I plan to mount this on a linen-covered square, and hang the finished piece where it can be easily viewed from a few steps back. 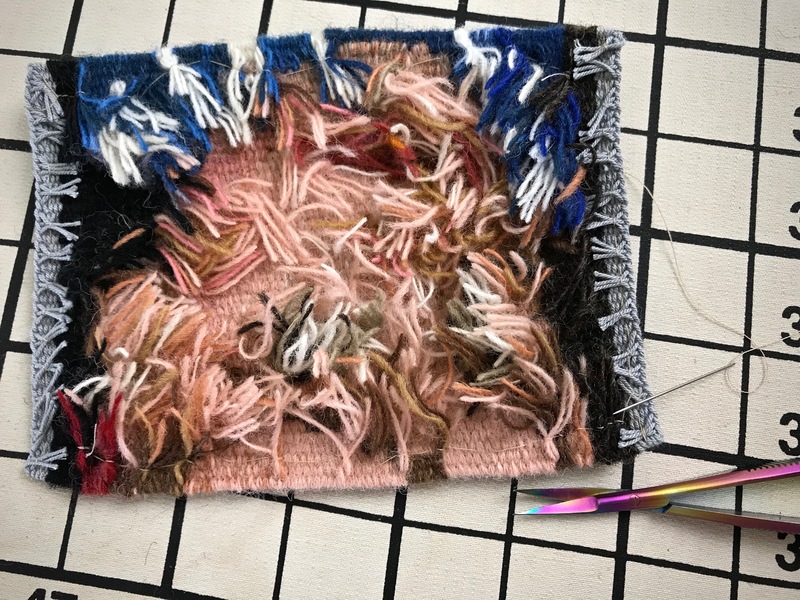 Small tapestry ends with a short hem, warp thread header, and a scrap header. I overestimated how far I could comfortably weave. 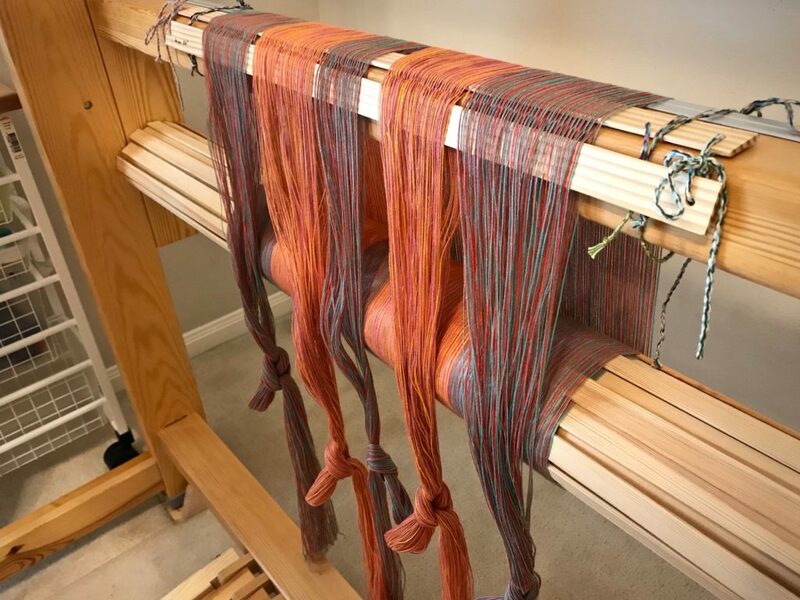 This is a less-than-optimal distance from the end of the warp for weaving. 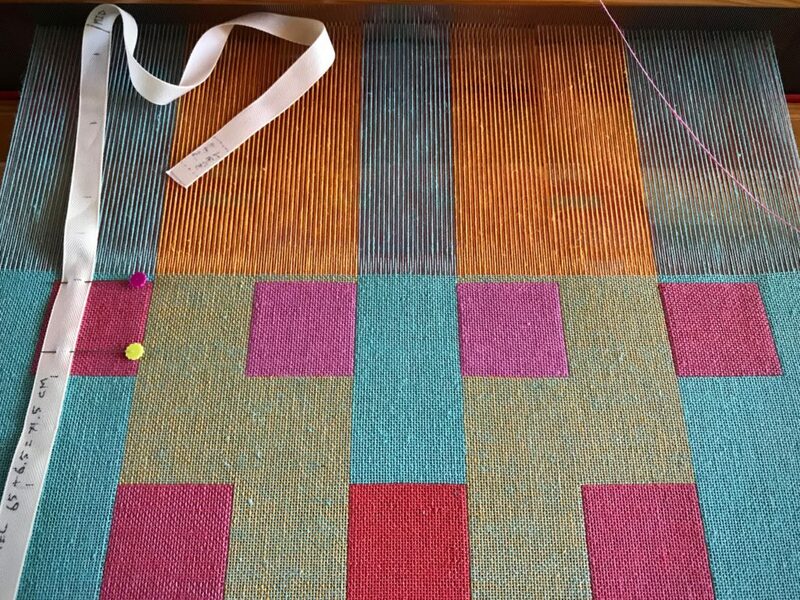 Most of my tapestry weaving is done in the evenings as part of my winding-down routine. In this session the back of the tapestry gets a haircut. 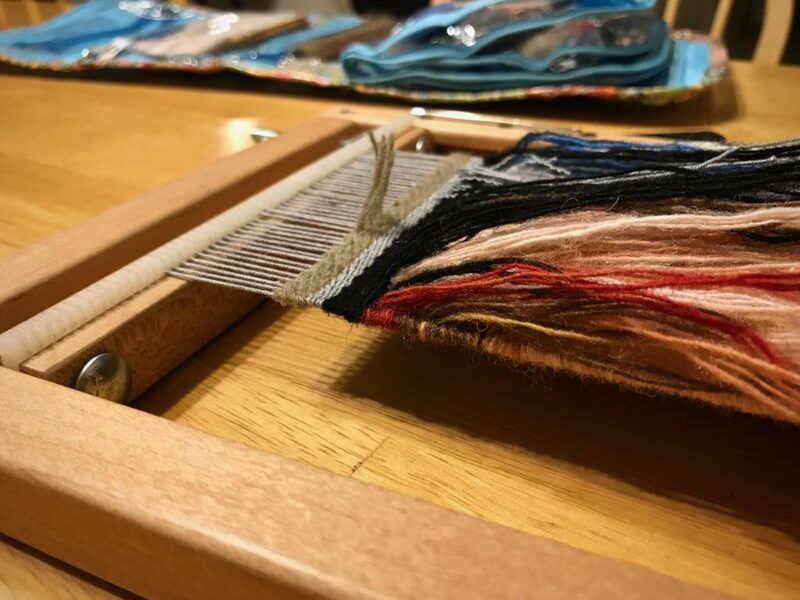 Straggler weft tails are reigned in with a little sewing thread. Finished Lucia Portrait Tapestry is 4 1/4″ x 4 7/8″. Enjoy this slideshow video. The ending is sure to make you smile! Good morning, Joyce, The time comes in snippets, but those snippets add up. Children grow up fast, so it will be nice to have a tapestry snapshot of this young age. Karen, This is just lovely! Such a special piece. Yes, the ending made me smile. Good morning, Beth, Thank you for your sweet encouragement. I’m glad you enjoyed the little clip at the end! So sweet! Such a small piece, but the amount of work amazing..I hope you might do maybe a trilogy? As she is growing…beautiful memento for her to keep. Thank you for recognizing the amount of work that went into this small piece. This slide show was just what I needed on a dreary rainy morning! Such a lovely small piece. I am so impressed with your color gradation/detail. May I ask what yarns you use for these small weavings? Many thanks! And yes the ending is so sweet! Hi Pamela, I’m happy the slide show had an uplifting effect for you! I’m able to get some of the color gradation because I use three strands of Fårö wool. Using three strands enables me to make subtle changes in the color. The sett is 10 epi. Little Lucia in tapestry is a wonderful moment in time, Karen. You did a fantastic job! Hi D’Anne, It will be a captured moment to treasure. Hi Libby, I didn’t have much to lose, and so much to gain! Thanks for your kind encouragement. Great interpretation of the photo. It looks like she is watching you from every angle! And yes, I believe you should do a tapestry of each of the other grandchildren. Otherwise, what will they think? 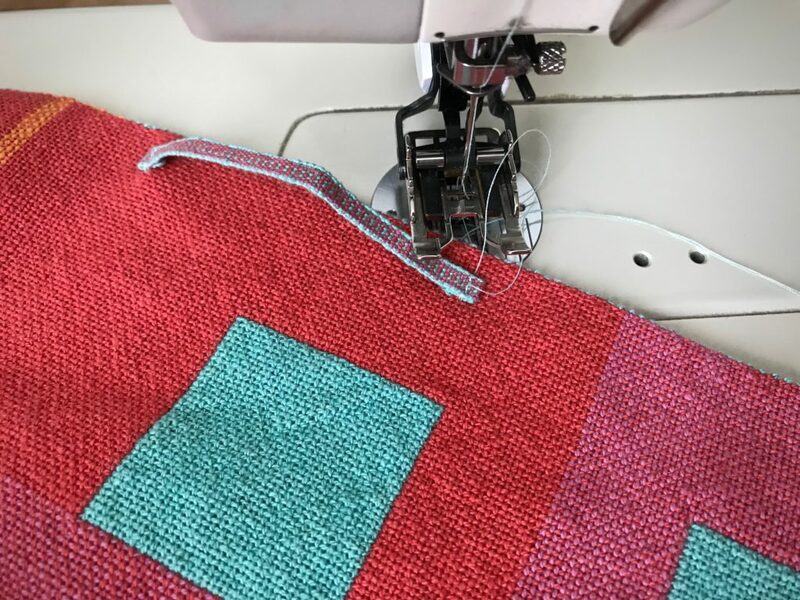 The precision of decision needed with each color choice when weaving tapestry explains how Penolope was able to ward off suitors while Odysseus was away. What non weaving person would voice an opinion deciding if one or two strands of a pink was needed for the ear lobe’s center, more than once? It is a beautiful jewel with Mona Lisa eyes. Hi Nannette, Yes, “precision of decision” is aptly put! Your Mona Lisa description brings a smile to my face. Do you dream of making upholstery fabric? I do. There are four chair seats at our Texas hill country home that I want to re-cover. 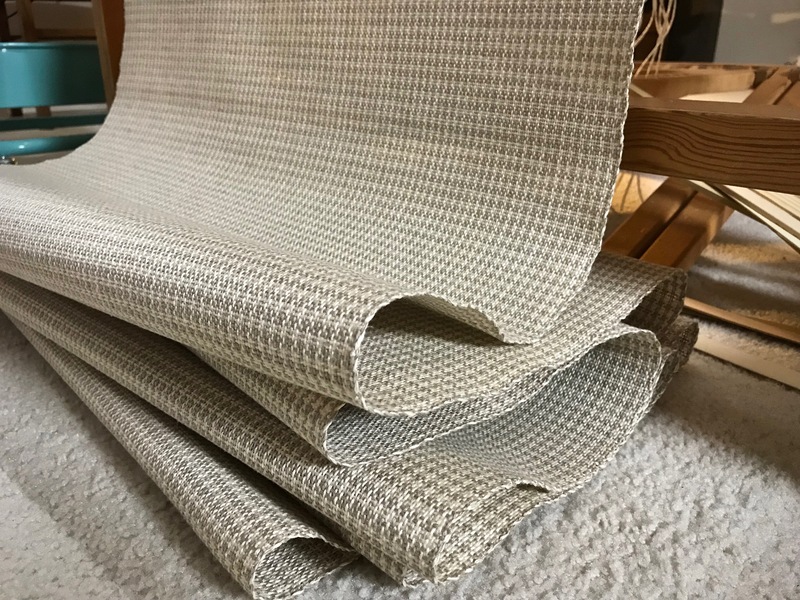 Now I have custom upholstery fabric! Cutting off never loses its excitement! I have one long piece of yardage, with no separations or divisions. 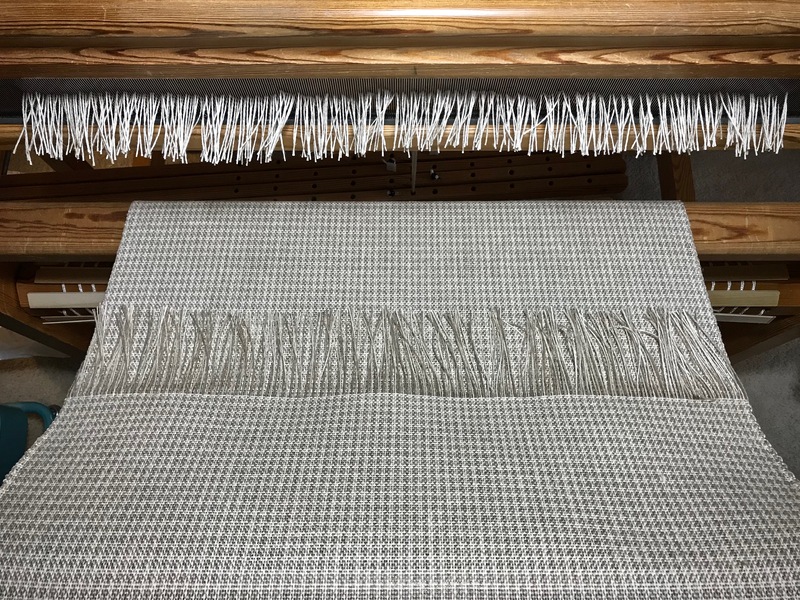 Just off the loom, the hefty linen fabric (8/2 linen, warp and weft) is stiff and unyielding. 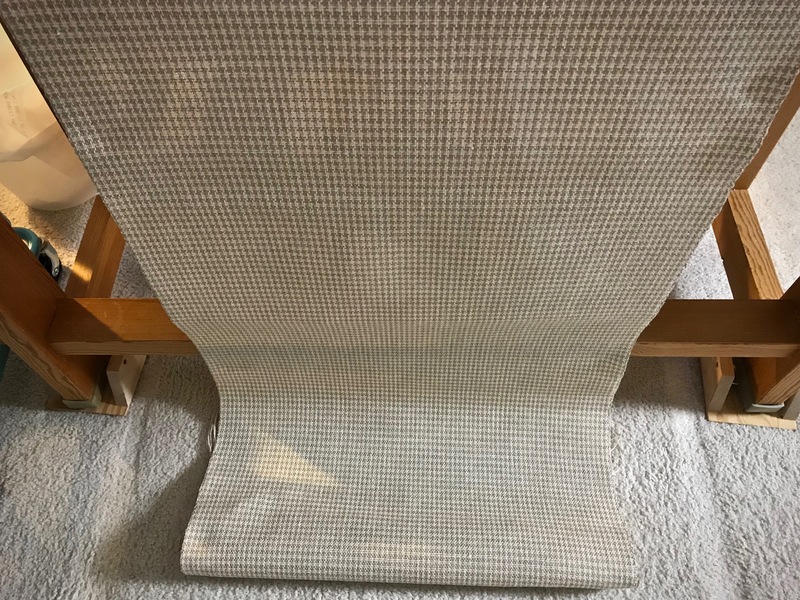 Will this window-screen material make suitable upholstery that’s soft enough to sit on? Yet, even in this state, the linen beckons and intrigues. First, the edges are serged. I check for weaving errors, finding none. 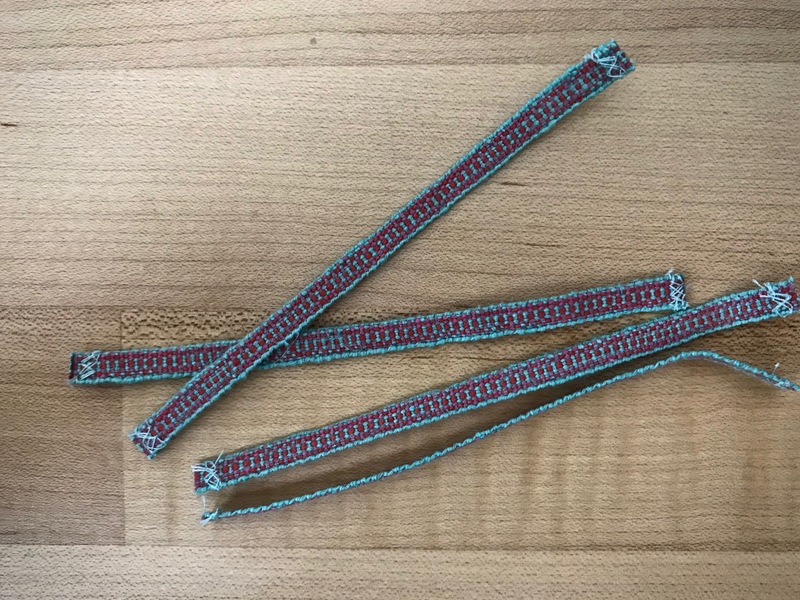 There are spliced warp ends in five places, which are trimmed. 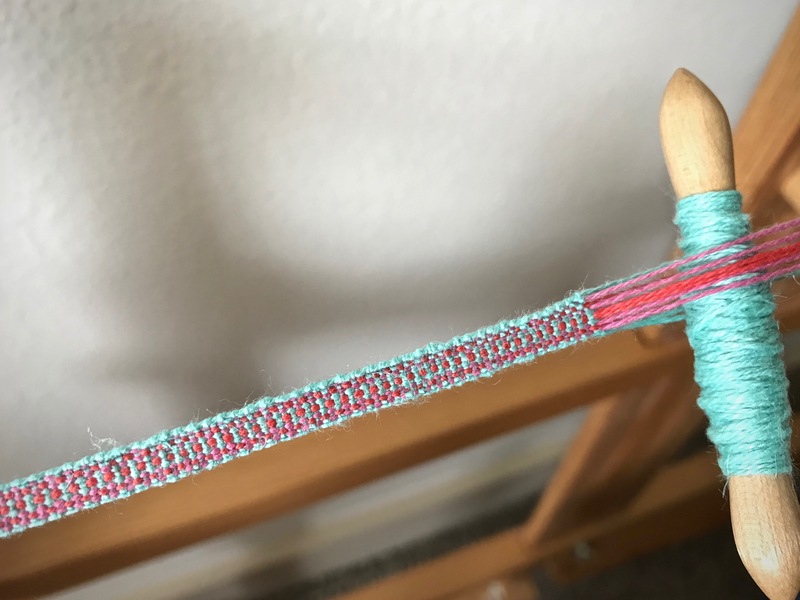 I make a large tube by basting the two ends of the yardage together, to reduce twisting in the wash. The washing machine (top loader) works as a soaking tub first. The linen slowly soaks up water in the tub, relaxing there for an hour or two. Then it’s time to wash and dry. The first time, I omit the spin cycle and remove it from the dryer while still damp, to prevent permanent creasing. And then, I wash and dry the yardage again. Talk about softening up! Oh, I wish you could be here to handle it with me! 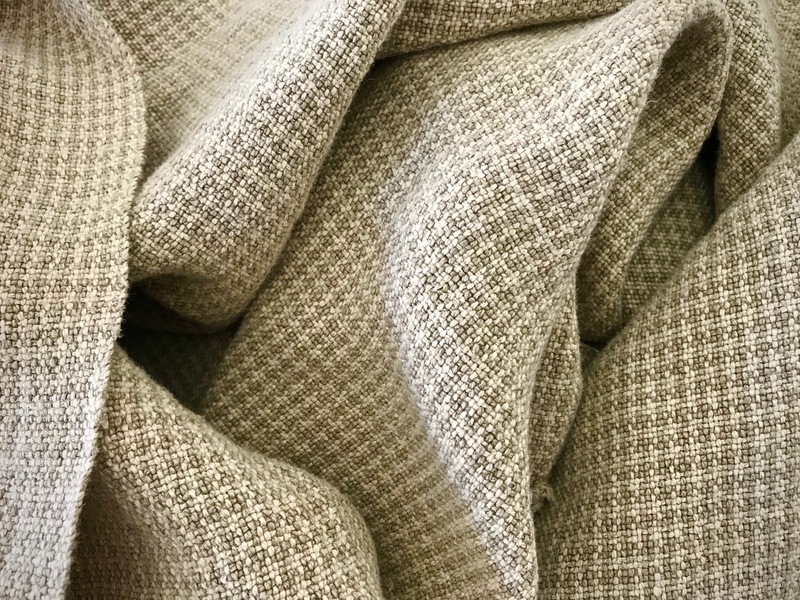 This is dreamy linen fabric, perfect for sitting. May your fabric dreams come true. What a great project! What sett did you use and how much shrinkage did you get with washing and drying. 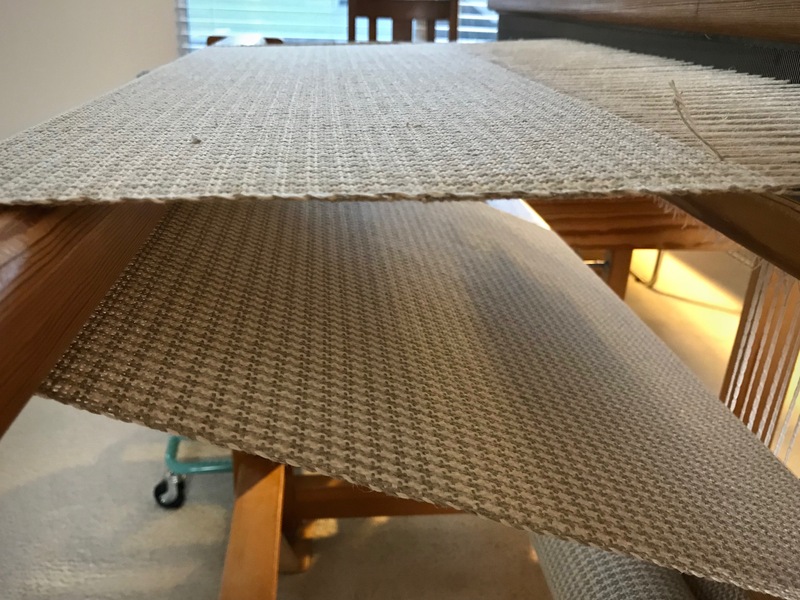 I have some dining room chairs that I want to recover. Your project may be the “kick” that I need to go from dreaming to doing. The sett is 15 epi. I haven’t done the final measuring yet. I’ll report back later today with the shrinkage after I’ve done that. Betsy, I have the shrinkage figures for you. I had 12% shrinkage in width and about 15% shrinkage in length. The fabric was washed in warm water and dried on a medium setting. Thank you for the info. That will help in my planning. I was just looking at a book by Ann Sutton called Color and Weave Design that has handreds of designs. They are all in black and white yarn and the book is arranged like pages of gamps. Betsy, Sounds like a fascinating book. I’ll have to look that up. Send me a picture (Karen @ warpedforgood . com) when you get something going. I’d enjoy seeing what you come up with. My current project is to make a jacket to through on on summer evenings. 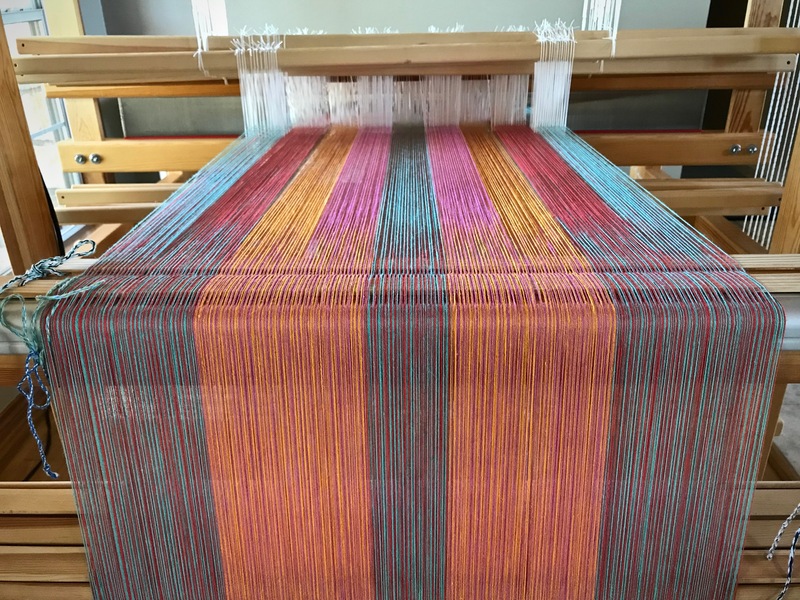 I’ve just wound a warp with 3/2 cotton for sampling. I’ll move on to upholstery fabric after I finish the jacket. Absolutely lovely! It looks like two colors. What colors did you use. Looks like grey or brown. What’s the weave structure? 4 or 8? Absolutely lovely! 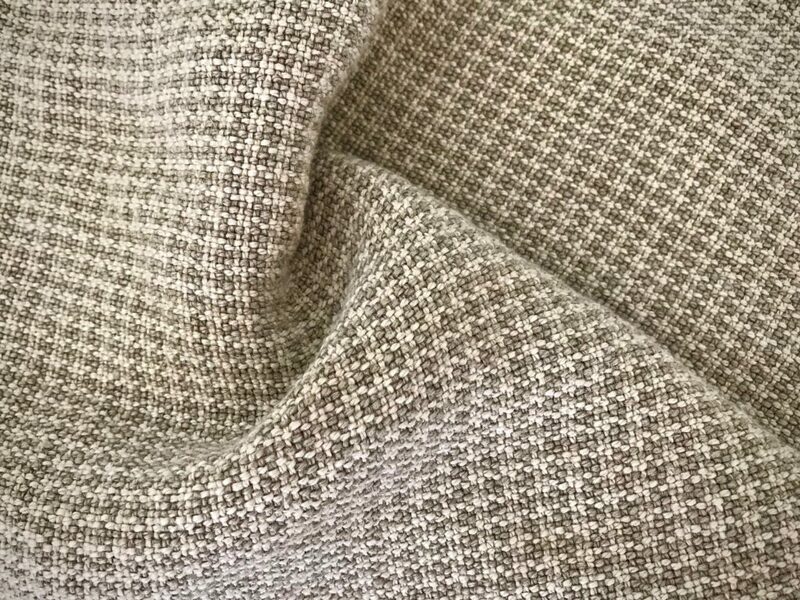 Hi Shari, This is 8/2 line linen, unbleached and golden bleached. 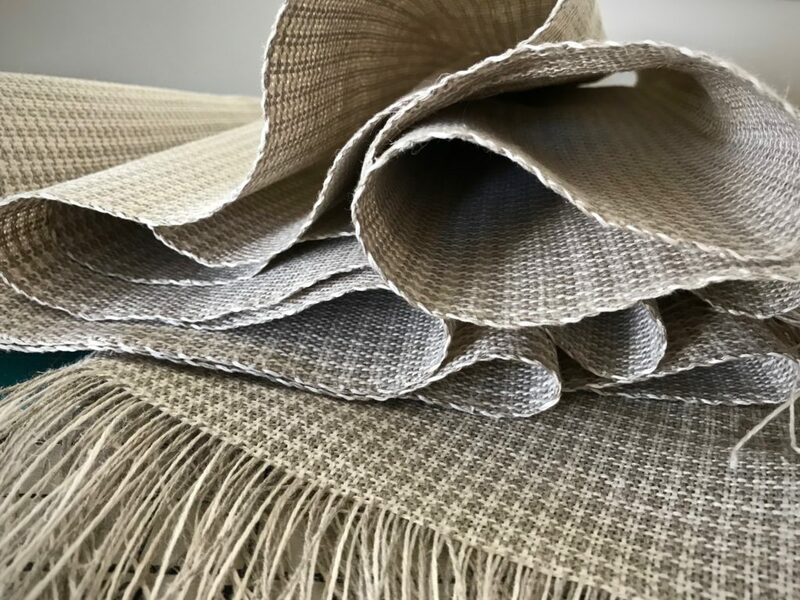 The look of natural linen is pleasing! 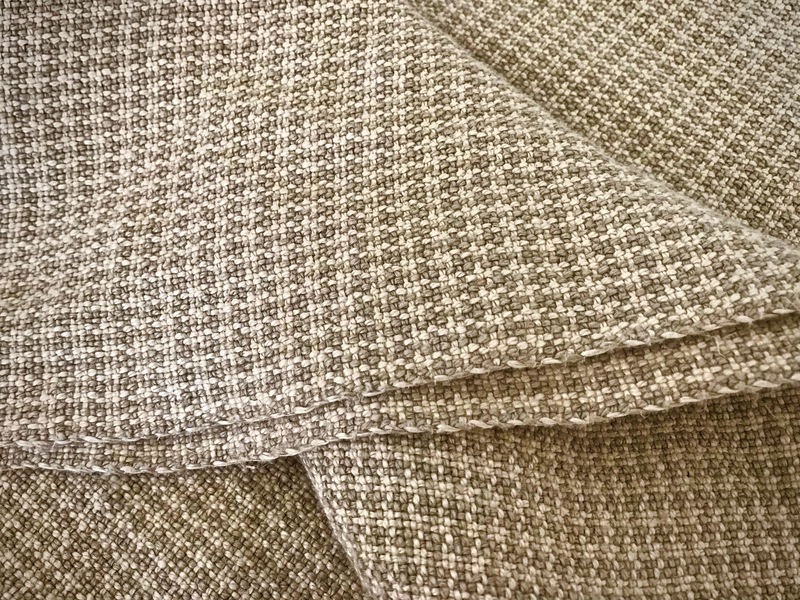 Four shaft plain weave, with color and weave effect. Only two treadles! 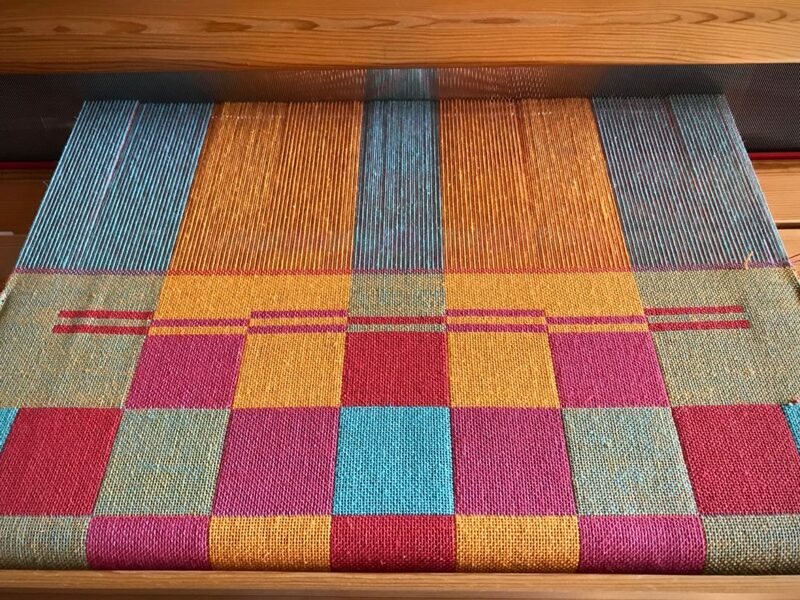 This was relatively fast and easy weaving. 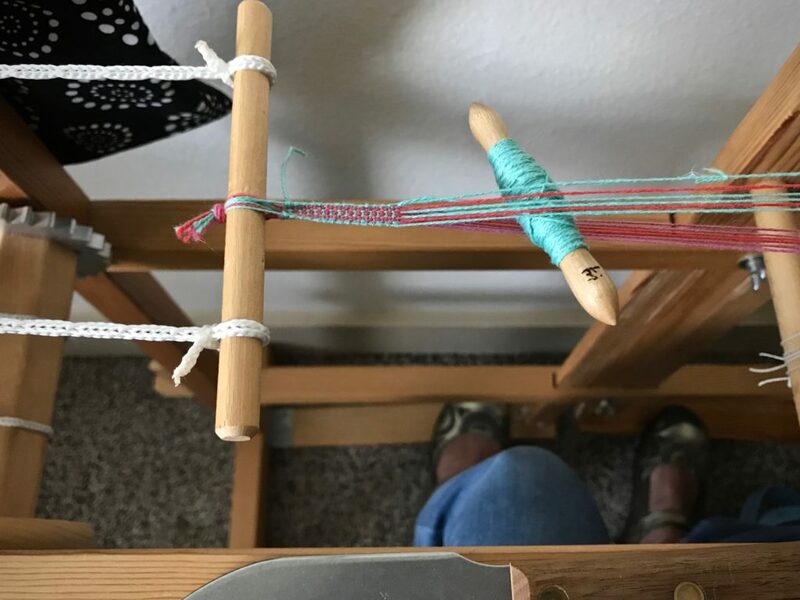 Love linen (having learned to spin on it decades ago) I really need to get my looms going. Thanks to your examples and encouragement. Hi Bev, I admire anyone who can spin, especially linen! 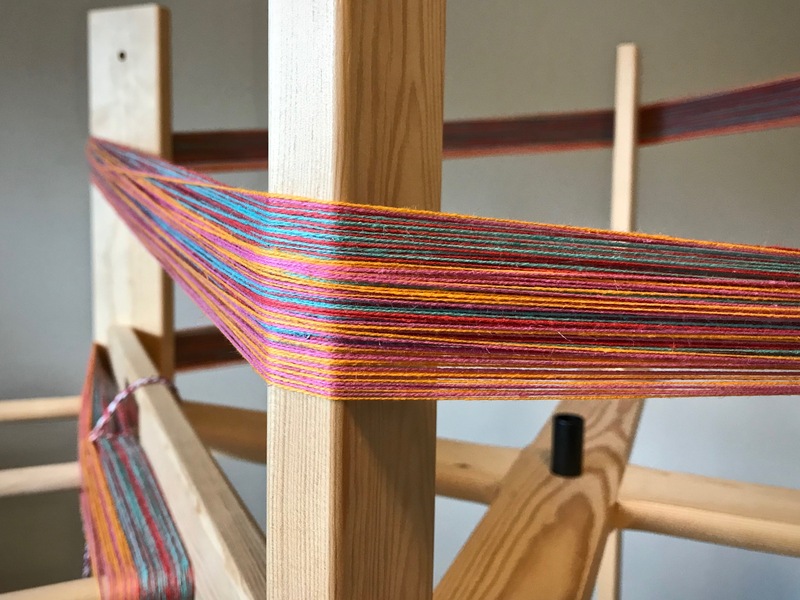 I’m happy to hear that you’re feeling prompted to get weaving looms going. That makes me smile! This is so beautiful Karen! I have a padded piano bench that was my mothers that I have been wanting to recover and this is the inspiration that I needed to get going. 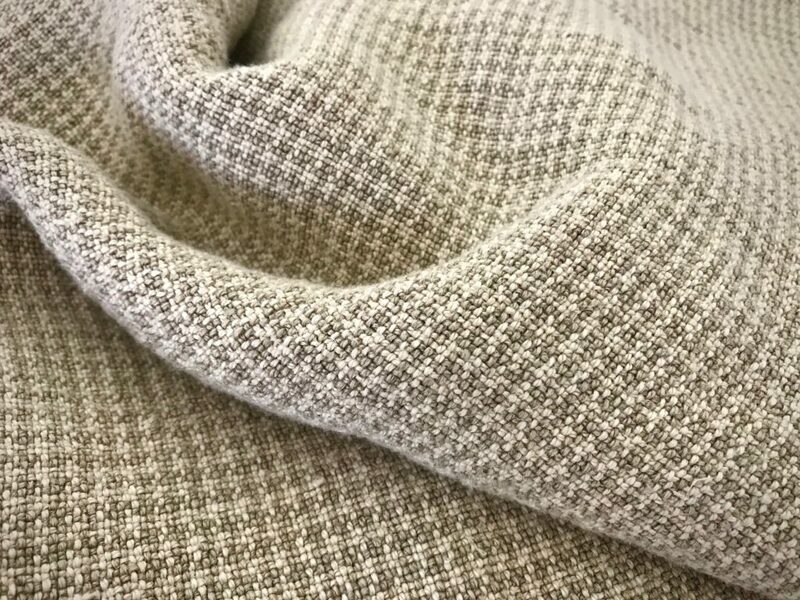 I’ll take any opportunity to work with linen and I just love the combination of unbleached and golden. 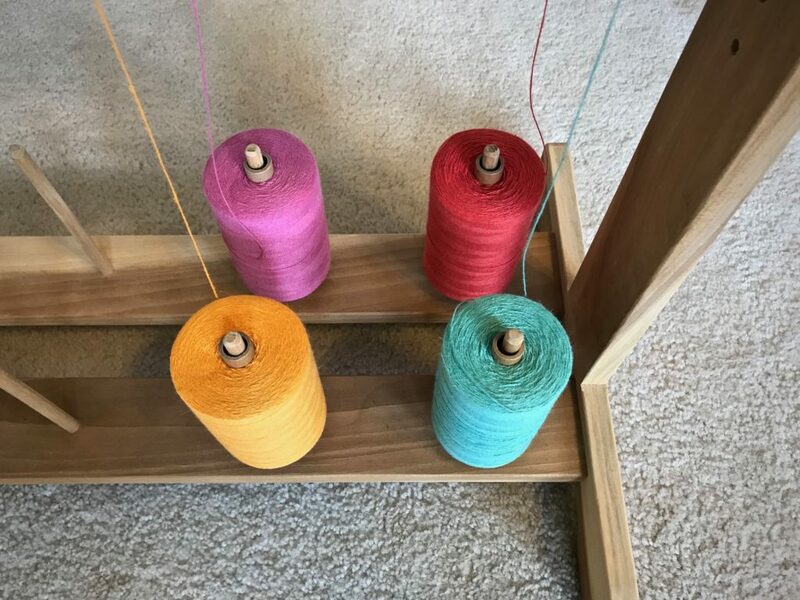 I’m wondering if a shadow and weave pattern would also work with this color combination of linen. The pattern might be more subtle, but could be interesting! Kathryn, How lovely to weave fabric for your piano bench! 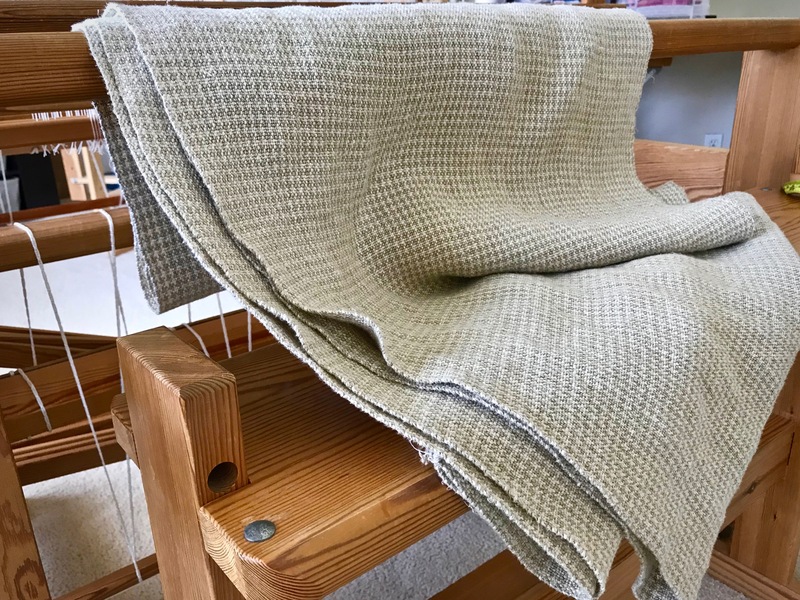 I think this weight linen will work well for seat and piano bench covers. The unbleached and golden linen give only a subtle pattern, so if you want the pattern to be more noticeable, you’d want higher contrast in the colors. I don’t have experience with shadow weave, so I’m probably not the best one to ask about that. I’d love to see what you come up with! 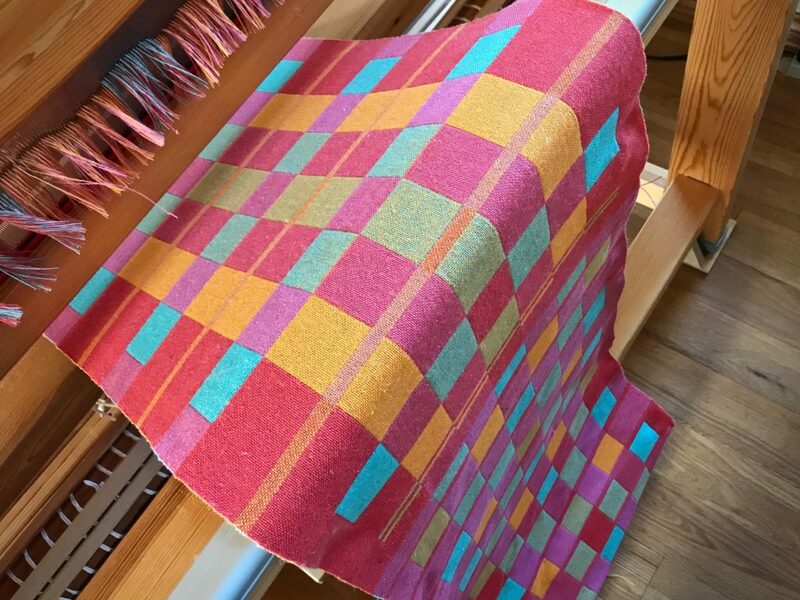 Your fabric came out beautifully (LOVE it)–I do so want to touch it! 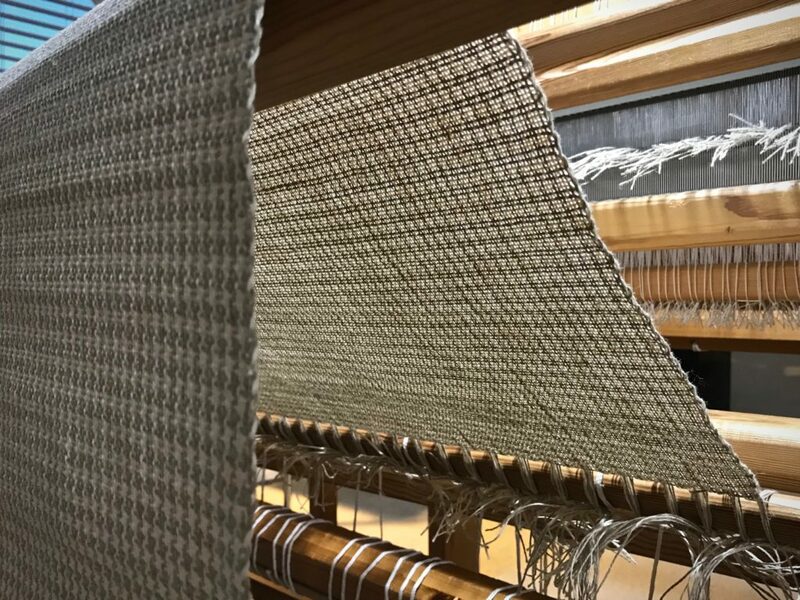 Do you have to do any special handling while weaving with linen (I have no experience with linen)? And how do you handle the fabric from the washer without using the spin cycle? Isn’t it heavy and dripping with water? Janet, Linen works best with a little extra care, but I find it a special pleasure to weave with linen. 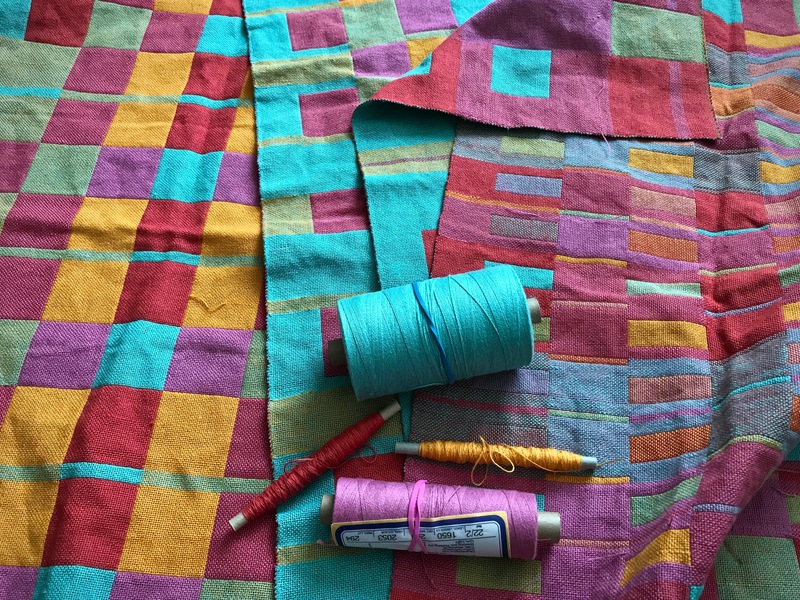 I have a sidebar with tips for linen in my Dice Weave Pillows project in Jan/Feb 2016 Handwoven. Generally, you want good, even tension across the warp as you beam the warp. Avoid abrasion as much as possible, for which a temple is helpful. And, sometimes a little moisture will help if you have warp ends breaking. Near the end of the rinse cycle I stand at the washing machine and listen for the water to drain out. When it sounds like the last little bit has drained and the spin has started, I stop the machine. 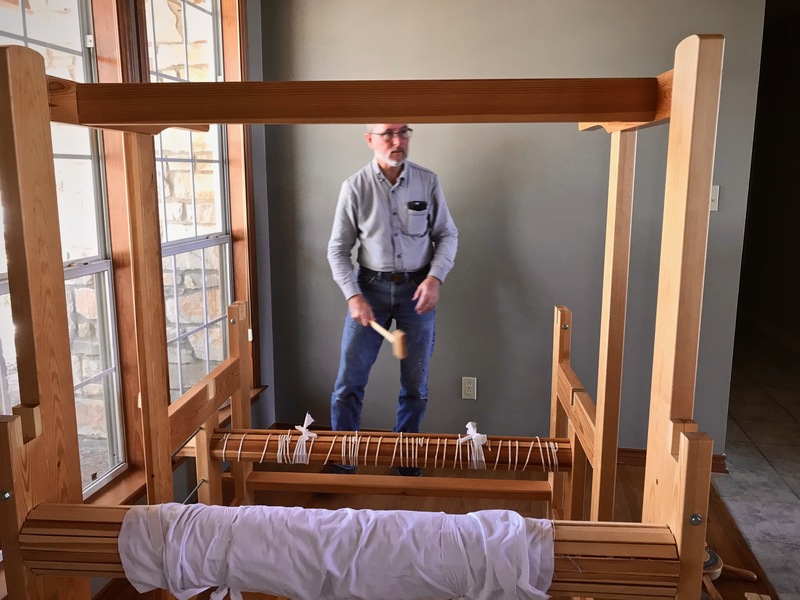 If there is still too much water in the fabric at that point, I even out the yardage, untwisting and unfolding it as much as possible and then turn it on and let it just barely spin. That gets enough water out so it’s not dripping wet, and I can to move it to the dryer. For smaller pieces, like towels, I don’t mind if they are wet and dripping. I roll them in dry towels to remove moisture before putting them in the dryer, or laying them flat to dry. By the way, this piece of linen yardage is heavy even when dry. When I first pulled it out of the washer it was really heavy! This is just beautiful! What a good idea to cover your chairs, I’ve done that many times over the years, but yours will be so nice. I can’t wait to see them done!! Hi Libby, I’m impressed that you have covered chairs many times! I’m a newby in that arena, but I have a book, resources, and friends to help. Oh it’s easy, you can do it!! I’m looking forward to it! Thanks for the vote of confidence. When we put together a weekend home I used one of the pieces to cover second hand dining room chairs. The result proves the rule to use beautiful things. Your beautiful newly covered chairs will give you years of enjoyment. Hi Nannette, Oh how wonderful! Thanks for sharing your experience. That’s great that you were able to put that special fabric to good use. I look forward to putting these chair seats together and sharing my enjoyment of them with my family and friends. 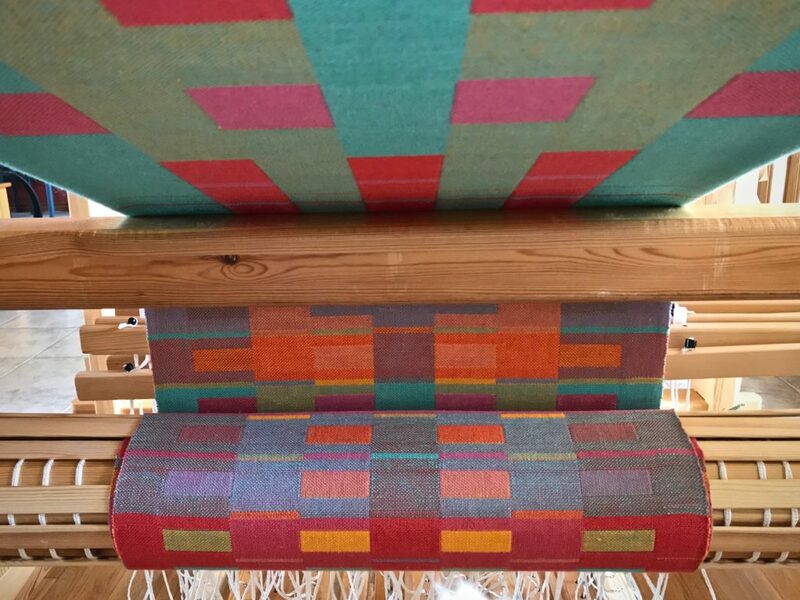 It’s a great way to be able to see and feel the handwoven fabric in daily living. Hi Doris, I am excited to have new fabric for chairs. I appreciate your kind compliment. This fabric is gorgeous! Such a pleasant weight linen and the beautiful suble texture and pattern really adds to its beauty! Thank you for so generously sharing your passion! Hi Elisabeth, You have a way with words. I enjoy hearing your thoughts—so rich and insightful. I agree, it is immensely satisfying to surround ourselves with beautiful things that are made by hand, with love mixed in. I'm glad you stopped by for a visit. You will find handweaving here, along with some insights to ponder. Enjoy! Copyright © 2019 Warped for Good. All Rights Reserved.